Mohammad Salman Hamdani, known as Sal, worked in our group from 1998-2001, and synthesized a number of new N-sulfonyl phosphorus compounds. He worked part-time as an ambulance driver and as a NYC police cadet, and graduated from Queens College in June, 2001, when he took a job at an HHMI lab at Rockefeller University. Hersh, W. H.; Xu, P.; Simpson, C. K.; Grob, J.; Bickford, B.; Hamdani, M. S.; Wood, T.; Rheingold, A. L. "Synthesis and Structural Characterization of Trivalent Amino Acid Derived Chiral Phosphorus Compounds," J. Org. Chem. 2004, 69, 2153-2163. 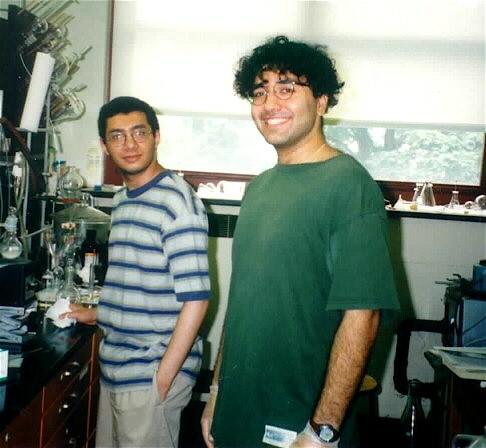 Sal (right) with Eli Ron in the lab, Summer 1998.